Images reportedly from a pitch made to Nintendo by Factor 5. The artwork we’ve published comes from a pitch document we got our hands on during the earlier part of 2008. Since then, sources tell us the game’s art-direction has advanced considerably. Despite this artwork not being reflective of the game’s current standing, we’ve decided to run it so fans can get a look at what Factor 5 has at least experimented with. 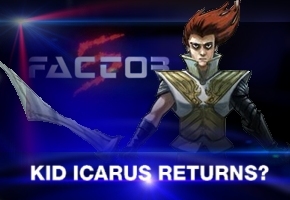 Despite only having one game in 1987 on the Nintendo Entertainment System, Kid Icarus has recently seen a resurgence in popularity with gaming websites like IGN hinting for years that a new game was in development. Even Nintendo seems to have taken notice, given Pit’s appearance in Super Smash Brothers Brawl, released two months ago. Could these really be images from a new Kid Icarus game? Stay tuned to TSSZ News for further updates as they happen.